Hello everyone! I am back from vacation and can’t wait to share the fun we had…but I still have a lot of photos to go through and some decompressing to do! So, until then, how about an awesome recipe and a giveaway? Let’s do it! As you know, I love America’s Test Kitchen and have a great relationship with them. When I visited the kitchens this summer, I was given an advance copy of their new cookbook The America’s Test Kitchen Quick Family Cookbook. Of course I love it…delicious and reliable recipes that are FAST? Yes, please. I found a real gem of a recipe in this book that has found a permanent place in our dinner rotation…the easiest-ever chicken pot pie. 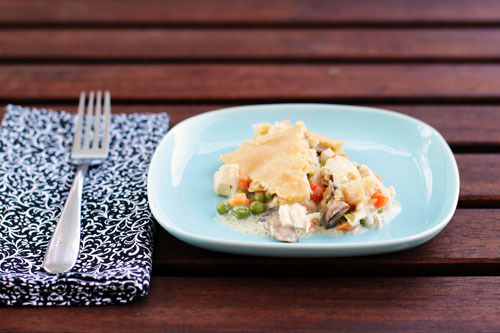 This chicken pot pie recipe is soooo yummy and it really is super easy. Everyone in our family eats everything on their plate and I’ve made the recipe several times. Boursin cheese is the secret ingredient. I love Boursin, but was a little worried it might taste too Boursin-y. It doesn’t at all, the flavor is fantastic and the gravy has perfect consistency. Now that the cookbook has been released, I can share the recipe with you AND give away a couple copies of the book! Yippee! 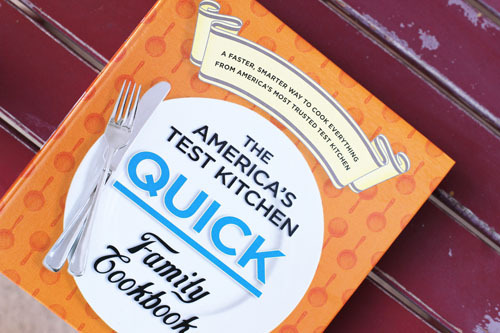 Two of you lucky people will receive a copy of The America’s Test Kitchen Quick Family Cookbook. As always, simply leave a comment on this post to be entered to win! You can add extra entries by liking This Week for Dinner and/or America’s Test Kitchen on Facebook. Be sure to leave separate comments for each extra entry! All comments must be added by Midnight PT on Wednesday, October 10, 2012. Adjust oven rack to middle position and preheat oven to 425 degrees F.
Boil chicken breasts until just done. Cut/shred with a knife and fork into bite-sized pieces. Saute mushrooms until softened and liquid has released. Combine broth, cream, cornstarch, ½ teaspoon salt, ½ teaspoon pepper in large saucepan. Break up cheese and mix in. Cook over medium-high heat, stirring often, until cheese is melted and mixture has thickened, about 5-7 minutes. (Note: I just leave the mushrooms in the pan where I sauteed them and add in the broth, etc and cook it with the mushrooms in there. Saves a pan and works great!) Stir in chicken, mushrooms, peas and carrots. Season with more salt and pepper if needed. Transfer to 9-inch deep dish pie pan. My pie pan was not deep enough, so I used a 10-inch cake pan. Carefully lay pie crust over top. Tuck overhanging dough underneath itself so crust is flush with edge of pan. Cut three 1-inch slits in top of dough. Bake until filling is bubbling and crust is browned, about 25 minutes. Rotate dish halfway through cooking. Let cool slightly when done then serve. America’s Test Kitchen is my absolute favorite cookbook series. And who doesn’t love chicken pot pie?!?! I like TWFD on Facebook. I have already liked This Week for Dinner & America’s test Kitchen on fb!! I really enjoy the show and would actually appreciate one of their cookbooks. Thanks for doing this giveaway! Winning this cookbook would be awesome! I love America’s Test Kitchen. Love Chicken Pot Pie! Thanks! and I liked ATK on FB. Thanks! 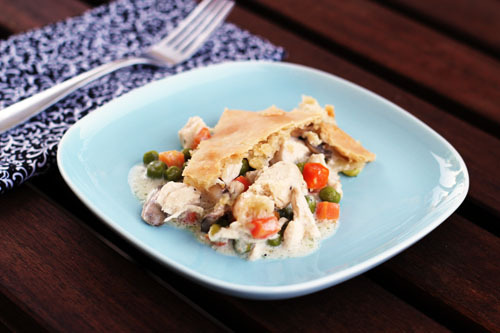 easy chicken pot pie recipe and yummy? sign me up! Oh My! This looks delicious!! Oh my, boursin cheese in chicken pot pie. I am definitely going to make this. Thanks for the opportunity to win this fabulous cookbook. I love everything America’s Test Kitchen. Pick me! Pick me, please! Love ATK! Thanks for the giveaway!!! I also liked TWFD on fb! Just Liked ATK 🙂 So hoping you pick me!! Never would have thought to add boursin cheese in a chicken pot pie. Love ATK! I like America’s Test Kitchen on facebook. Seems like a great cookbook. I would love to win one!! America’s Test Kitchen is the best. I love their cookbooks. I am always trying to sneak them into my cart at Costco…. I liked America’s Test Kitchen on FB, too! It looks like they have some really good ideas that they post, thanks for suggesting! Who doesn’t LOVE ATK! It’s great! Love ATK, have two of their other books, and would surely enjoy this new one! I liked TWFD on FB. I love America’s Test Kitchen and would love to win this. I like This Week for Dinner on FB. I love America’s Test Kitchen- thanks to them and my mom, I am a pretty good cook. This recipe looks easy, quick and tasty. I’m pinning it so I don’t forget to make it! I like America’s Test Kitchen on FB. can’t wait to try this! YUM…. I could definitely use some tried and true fast recipes. Chicken pot pie….conjures up favorite childhood memories of home…and makes me happy that comfort food season is approaching! YUM! Looks like yummy pot pie! Sign me up! I love America’s Test Kitchen and their cookbooks. They are some of our favorite go to recipes! Love American’s Test Kitchen and chicken pot pie! I am all for quick and tasty family recipes..thanks for the chance to win! I absolutely love chicken pot pie. Thanks for sharing the recipe. How could we possibly lose with this one?! Thanks for the giveaway! I love America’s Test Kitchen and know I would use this cookbook religiously. I liked America’s Test Kitchen on FB. Thanks for doing this giveaway! I also liked This Week for Dinner on FB. Thank you! Yummy, that chicken pot pie sounds delicious! I’ve never heard of Boursin cheese. I better try this recipe. I would love to try out this cookbook! Since I toured their kitchen with you – I know I ‘d love their cookbook! I already like TWFD, but I just went to “like” America’s Test Kitchen. I almost bought the cookbook at Costco today, and browsed through an open copy. Looks great! I liked this week for dinner on facebook. This looks delish! Will try this next week! I love America’s Test Kitchen cookbooks – I would love this one! ok, I have been cooking for years and never heard of this cookbok series. If I don’t win it I will have to look into it since I trust all you people who are saying you love them! America’s Test Kitchen tips are the most help when trying new techniques for a recipe. Looks amazing and so easy! Thanks! I’d love to have this cookbook in my cupboard! It would become my new go-to. I love boursin and my husband loves chicken pot pie! A marriage made in heaven. Love ATK! Will try for sure! I want this cookbook! I love ATK and I love fast! I liked This Week for Dinner. This looks yummy! I love America’s test kitchen! I liked America’s test kitchen on Facebook! I’ve not heard of or seen Boursin Cheese. Is it fairly easy to find. I knew this was going to be the book! I’m sure it will be a winner just like all the other ones. I made one of their pasta recipes using Boursin, zucchini and cherry tomatoes, it was awesome, the sauce was almost alfredo-like, but not heavy at all, can’t wait to try this recipe! Sounds like the perfect cookbook to jump start my fall meal planning! what a lovely pie! thanks for sharing! I would love this! I need quick dinner ideas! I like Americas Taste Kitchen on FB! lovely pie! thanks for sharing! I love Chicken Pot Pie but have not found one my husband loved so maybe this will be it!! Love Americas Test Kitchen recipes, they always turn out great! I would love this cookbook! I’m always looking for quick and yummy recipes that my kids will eats. I’m making this tonight. As always thanks for sharing! I LOVE Chicken Pot Pie but I almost never make it because it takes so long. This recipe looks much easier than the usual. Thanks! I’m going to try this this weekend. Looks great thanks for sharing! The pot pie looks delish! Can’t wait to give it a try! I love America’s Test Kitchen recipes, but only if they are quick and easy. Many times I find myself dirtying every pot/bowl/spoon in the whole kitchen for their lovely dishes! Usually worth it, though! Love America’s Test Kitchen! The pot pie looks great. I’m hoping my husband and sons will like this recipe since they don’t really care for my current chicken pot pie recipe. I would love the cookbook too. Love this!!! This recipe looks so good! Can’t wait to try it out on my family. I’m already a facebook fan. And now I’m an America’s Test Kitchen fan. Love ATK and your blog… Yea for giveaways! I like This Week for Dinner on facebook. I’d love to win this cookbook! :)I’m definitely trying to pot pie recipe soon! That pot pie does look delicious; I’d love to win the cookbook! 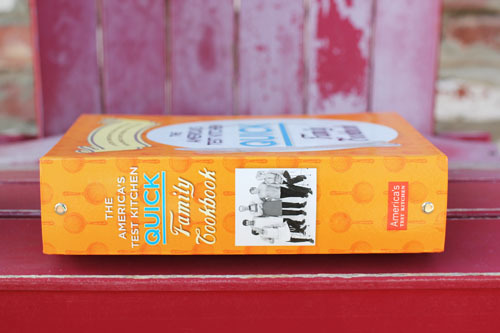 I loooove the America’s Test Kitchen books…and this one looks particularly awesome. Thanks for sharing! I’d love the book! I love chicken pot pie. It’s even better if it’s quick and easy! Let’s prove you CAN teach an old dog (or grandma) new tricks — especially in the kitchen. Sign me up! We just made ATK’s waffles this weekend, and they were awesome! I’d love to win. I love America’s Test Kitchen! Must make this – thanks! 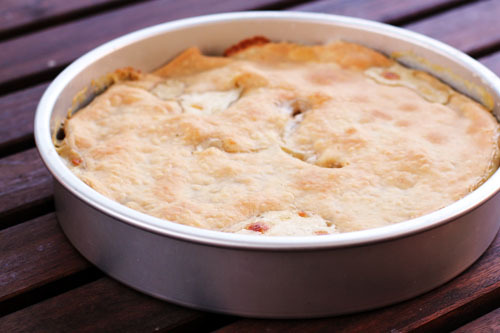 I LOVE chicken pot pie & can’t wait to try your recipe! looks yummy – and what a great sounding cookbook! I love America ‘s Test Kitchen. This looks delicious! Thanks for sharing and for the possibility to win the cookbook. I have liked Americas Test Kitchen on Facebook as well. Thank you again. Thanks for the heads up on this cookbook and the chance to win it! That pot pie sounds amazing! I love their books and would love to add this one to my collection! Thank you for the chance to win the cookbook. I really really want to win this! My hubby loves chicken pot pie! I’d love to own that cookbook! 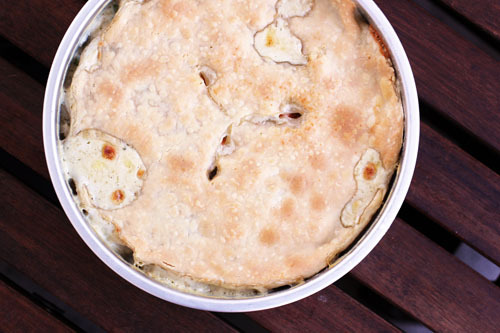 chicken pot pie sounds perfect for the upcoming colder months. YUM!!! I LIKE TWFD already on FB!! I love watching America’s Test Kitchen on PBS. This cookbook would be a blessing! The food they make always looks so good! Looks like the perfect working mom cookbook! This is one meal everyone in my house will eat, and this version looks easy and tasty…thanks for sharing! Browsed Americas Test Kitchen on Amazon and I think I’m in love, looks wonderful! This Week for Dinner liked on Facebook! America’s Test Kitchen like on Facebook! This looks amazing! Love your receipes and menus! I had to message your sister Jess-as I had lost the site address. .
I’ve been waiting for this one! Yay! I love America’s Test Kitchen! I record the TV show! AND I’ve been looking for a chicken pot pie recipe! Win/win! Comfort food at it’s best! Love chikky pot pie, and what great timing- with The cooler weather arriving to Houston this weekend! I am also a big fan of Americas Test Kitchen, they know what they’re doing! Yay, I hope I win. Have already liked you on fb. Been a fan of ATK on fb for years. Chicken pot pie and quick, that’s for me! I absolutely LOVE America’s test kitchen, too! It is the only cooking show I love to watch since we no longer have cable (Food Network). This pie looks wonderful. I can’t wait to try it. Test kitchen recipes are always good, love their shows, books & magazines. Would love to win this book. Like America’s Test Kitchen on FB. I love ATK’s cookbooks. They are the best! I’ve never heard of this cookbook, but it seems like something I want. I haven’t gotten a new cook book in such a long time. I have been wanting to try one from this series-thanks for the opportunity! I just “liked” TWFD on Facebook- thanks! I love Americas Test Kitchen & I really love pot pie! I would love to try this cookbook! I would love some chicken pot pie tonight! yum! I like *This Week for Dinner* on facebook! I love chicken pot pie, sounds fabulous! Oh, sounds perfect for fall! Can’t wait to try. chicken pot pie is one of my most favorite comfort foods! looks so easy! I love America’s Test Kitchen- everything always turns out delicious! Thanks for the chance to win this cookbook. I would love to add their cookbook to my small (but growing steadlily) collection. I liked ATK on FB! I would love to own and use this cookbook! You can’t go wrong with Americas Test Kitchen Cookbooks. We LOVE America’s Test Kitchen! My four year old even loves to watch on PBS…how can you not love Christopher Kimball? Anyway would love to give this book a try because as you mentioned their recipes are truly reliable and delicious and making them fast would be a huge plus with littles in the kitchen! Thanks! Love American Test Kitchen! Would love to try some new recipes and the chicken pot pie sounds wonderful. Thanks! Wow, just found out about this cookbook a few minutes ago. It would be exactly what I need – beginner cook with precious little time each day given my three month old son! Would love to cook great meals for my family. Thanks for the giveaway!! Sounds awesome. I am in need of comfort food right ow. What a great giveaway! I hope I win! What a great birthday present to myself. Can’t wait to try this cookbook! I would love to win the recipe book and have a slice of that chicken pot pie! Thanks for the recipe~ looks delicious! so glad you tried it AND loved it. I was seriously stunned how much we loved it the first time! 🙂 soooo yummy! thanks for commenting! Tried this tonight–OH MY GOODNESS! The most decadent pot pie. So so good. I used the garlic and herb Boursin since it was all I could find. Delicious. Thanks so much for posting! Since it was so easy to double the recipe (1 bag of veggies was perfect and the crust and chicken are sold in the perfect quantity for 2), this is going to be my new dish I bring for new parents! Thanks again!!! tried this a couple weeks ago and the whole family loved it. SO GOOD! My boys keep requesting it. Thanks for sharing! eryn and lindsay – SO glad you love it! eryn – I just love it when I find a recipe that my kids actually request – score! I made the chicken pot pie last night. It was quick, easy, and DELICIOUS. The one I normally make takes an hour and a half just in addition to baking time…this one took far less time to make. It was fabulous! My family liked it better than the one I usually make. Yay! Thanks for another great recipe!